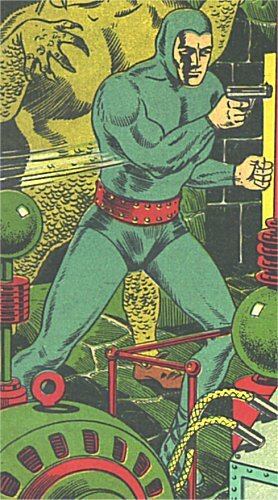 Powers/Abilities: The Blue Blaze has superhuman strength, "1000 times that of a normal human", allowing him to lift something in the region of 8 tons. Invulnerable. He goes into periodic hibernation between adventures, somehow sensing evil and travelling through the earth while in this state to emerge where he is needed. He also came into the possession of a high velocity speedster at one point, though it was never established how or why. History: (Mystic Comics #1, ga) In 1852 Spencer Keen was on his way to a masquerade ball at his local college, when he decided to drop in on his scientist father, a doctor at Midwest College. Dr.Keen showed his son his latest discovery, a strange blue flame which seemed to be able to put living creatures in a death-like trance, only for them to eventually revive far stronger than they had been before. At this point fate intervened, and a tornado hit the area. Spencer was struck by some flying debris, and knocked into the fire; his father was killed. In fact, most of the townspeople were killed in the ensuing chaos. Spencer and his father's bodies were soon discovered, and like the other victims, they were swiftly buried to prevent disease spreading - in Spencer's case, they didn't even bother to change his clothes. But Spencer was not really dead. In his comatose state he gradually mutated, transforme by "substrate dermatic rays". Nearly ninety years later his rest was disturbed when minions of Professor Mulaski dug him up. Mulaski was a mad scientist who was creating zombies with which to conquer the world, but he had reckoned without Spencer Keen, now charged with superhuman powers and a similarly superhuman sense of justice. Spencer awoke, and calling himself the Blue Blaze, he swiftly thwarted the evil professor's plans. (Mystic Comics #2, ga)The Blaze's next case saw him send the insane inventor Barko to an asylum, after Barko had begun a reign of terror using his "ice ray guns". (Mystic Comics #3, ga) Next he faced crime syndicate leader Dr.Gair, who used the power of the stars to create hideous monsters and lethal energy bolts. (Mystic Comics #4, ga) Then he stopped Dr.Vortex from plunging two Balkan nations into war with one another. 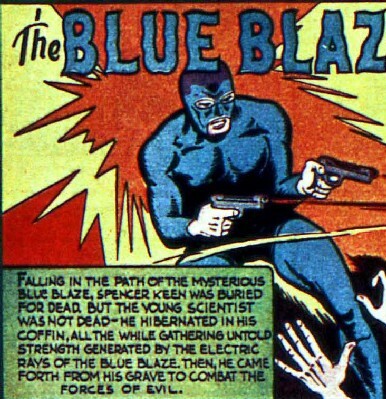 (Mystic Comics #4, bts (announced for Mystic Comics #5, but never appeared), ga) The Blue Blaze faced the Vampire of Doom.